| Next: Sammy and Freddy? | Next: The Photoshop Challenge! Chris Michaels, the morning host from "The Big Show" on 94.3 Buddy FM in Rushville, Indiana drove up to Michigan Tuesday morning to pick us up. This was no ordinary ride, as Chris did his radio show from the driver’s seat of the car. He left home at 2:30AM to drive up to Michigan to pick us up and take us into Indianapolis. Chris heard about us right when we started in October, and he’s been checking in weekly for updates along the way. He’s a cool easy going guy, with a great radio voice. It was pretty sweet, just sitting in the car talking on a microphone, live on the air, all run through a cell phone. We did frequent updates and different segments of his show for three hours, all the way into Indianapolis. Hanging out with Chris was a great lesson on radio. People can only hear a voice, so the DJs totally mess with the audience. 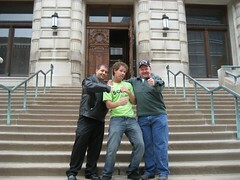 All the listeners thought we were riding in a limo provided by an Indiana car dealership as a promotion. But, the promotion was one sided, as we were actually riding in a Chevy Aveo. I bet Chris did get a free limo, but already used it with his friends. Oh well, we didn’t care, it was awesome to meet Chris and do the morning show with him. 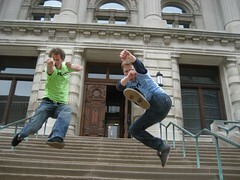 Chris took us right to the capitol building in Indianapolis, we had a look around and got some jump shots. Number 40: done. With only 10 states remaining, we agreed the final countdown has officially begun, cue “The Final Countdown” by Europe. Sean, a local Indy resident met us there too for some photos and to hang out. After hanging around talking with people we joined our new hoosier friends for lunch in the circle city. First Rainbow in the Dark and now The Final Countdown. This just gets better and better. Ha ha! That was so something a Judge would say.